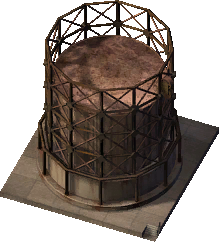 The Petroleum Tank is a Dirty Industrial Machinery Building that grows on Medium and High density Industrial Zones. When the Colossus Addon Mod is installed, the default lot stages are rebalanced and the number of jobs is increased to 64. It is otherwise unchanged. This page was last modified on 6 June 2014, at 15:45.